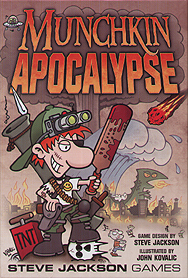 In Munchkin Apocalypse, every possible natural (and unnatural) disaster has happened... or is about to. You are a rugged survivor in a world full of people - and Things - that want to kill you and take your stuff. So do it to them first! This set introduces four new classes and a new, yet eerily familiar, card type: Disasters! There's also a new way to end the game. You can reach Level 10, like always... or you can open seven seals! Featuring a guest Monster from Ethan Nicolle.